In this moving, wry, and candid novel, widely acclaimed novelist Ayelet Waldman takes us through one woman’s passage through love, loss, and the strange absurdities of modern life.Emilia Greenleaf believed that she had found her soulmate, the man she was meant to spend her life with. But life seems a lot less rosy when Emilia has to deal with the most neurotic and sheltered five-year-old in New York City: her new stepson William. Now Emilia finds herself trying to flag down taxis with a giant, industrial-strength car seat, looking for perfect, strawberry-flavored, lactose-free cupcakes, receiving corrections on her French pronunciation from her supercilious stepson – and attempting to find balance in a new family that’s both larger, and smaller, than she bargained for. 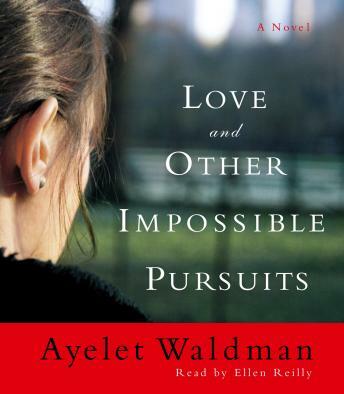 In Love and Other Impossible Pursuits Ayelet Waldman has created a novel rich with humor and truth, perfectly characterizing one woman’s search for answers in a crazily uncertain world.